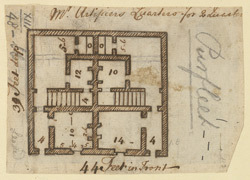 Plan of one of the artificer’s or craftsman’s house at the magazine in Purfleet. The gunpowder magazine was built in the 1760s to replace a magazine in Woolwich which had been damaged in an explosion. Purfleet had five large magazine buildings used to store gunpowder and each could accommodate 10,400 barrels. As well as the five magazine buildings there was also a Blacksmiths shop, a guardroom, barracks for soldiers and the officers and some labourers tenements.